Frequent-pattern mining has been studied extensively and has many useful applications. However, frequent-pattern mining often generates too many patterns to be truly efficient or effective. In many applications, it is sufficient to generate and examine frequent patterns with a sufficiently good approximation of the support frequency instead of in full precision. Such a compact but “close-enough” frequent-pattern base is called a condensed frequent-pattern base. In this paper, we propose and examine several alternatives for the design, representation, and implementation of such condensed frequent-pattern bases. Several algorithms for computing such pattern bases are proposed. Their effectiveness at pattern compression and methods for efficiently computing them are investigated. 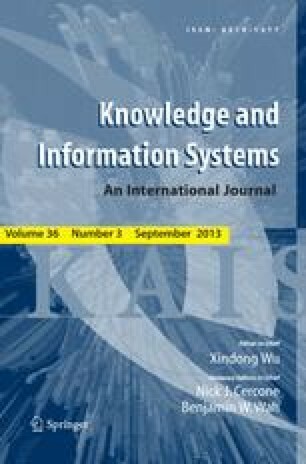 A systematic performance study is conducted on different kinds of databases, and demonstrates the effectiveness and efficiency of our approach in handling frequent-pattern mining in large databases.